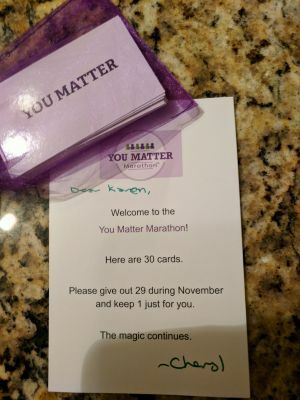 Dear YuMMies (my term of endearment for YMM participants): One week to go before the official launch of the 2017 You Matter Marathon! If you’re in our Facebook community you can already see and feel the magic brewing. Sincere thanks for our most recent radio interviews with: Cathy Blythe of Problems and Solutions, Dave Schmidt of KKOJ AM/FM and, a podcast from Emiliya Zhivotovskaya of the Flourishing Center. The YMM now has 19,784 participants, and 158 Ambassador organizations from all 50 states, and 23 countries. Some new Ambassador organizations include: Nebraska Department of Corrections, Saint Francis Academy, and Logan Middle School Kind Kids Club. Invite a school, community group, place of worship, or company to join the YMM as an Ambassador. Just send them to our website. Enjoy the essay below by YuMMie, Jennifer Schelter. She beautifully captures the ways You Matter is sprinkled through our connections with each other and within nature. To me the marks looked like a combination of Zen calligraphy, and healing wounds. I repeated, “And that” to myself memorizing her speech pattern and mouthing it to my sister-in-law, Julia, who smiled and mouthed “and that”. Shari said “And that” at the end of almost every sentence and I loved it. I thought about mid-late-life, how things felt gangly, untethered, uncertain and often dark. I thought about my struggles to re-define myself and career, my boyfriend’s struggles with a new leadership position, my mother’s struggles with her hip, my father’s struggles with his knees, my brother’s struggles with a job search, my sisters and sister-in-law’s struggles working full time, raising children, caring for dogs, homes, husbands, and careers, my nieces and nephews struggles with becoming teenagers and being kids. As I walked I wanted to feel closer to everyone in my family and to reframe these struggles not as “struggles” or “problems” but as our humanity, our human growth. On the surface, I thought, we looked like “A Lovely Happy” privileged American family and yet underground we’re all working our hardest, suffering at times, all in need of support and compassion. I heard the Aspen leaves in the breeze, like light rain, a rustling, light flutter. I closed my eyes for a few steps and visualized a root ball, like telephone lines underground, zigzag connecting my extended family from Arizona, to Colorado, to Rochester, Florida, England, France, Iraq, California, Oregon, Boston, Cape Cod, Maine, NYC, and Philadelphia. Roots that included my extended family and friends adopted as family. Especially those friends who had moved away or for whatever reason hadn’t returned my phone calls or notes. I longed to reconnect with them too. Wish them well. Let them know I missed them. Thank them for the times we’ve shared. The root ball would be the size of the earth. We all nodded, Yes. Incredible. “I thought you’d enjoy this,” he said. And may Bruce, my college sweetheart, fighting cancer, prevail. My prayers are not religious. They are more like benevolent longings of love gratitude for being part of the infinite, whatever the infinite is. Stardust, space and baby sea turtles scampering to the sea. My words and body and mind come together as a triptych of appreciation for an infinite forever thank you for the beauty of intimacy, sentient beings and precious time on earth. Once back in Pennsylvania, I texted Bruce: Thinking of you. Sending you positive healing vibes. You’re in my thoughts. He taught me how to sail a Sunfish, mountain bike the California desert and be a lifelong friend. He included a picture of him, his two daughters and wife. He’d lost his hair and was thinner. I held onto the edge of the stove and looked closer. He looked like his father; that time he waved goodbye from Nantucket wharf. I remembered Bruce’s thick brown hair in college grew so fast he called “chia pet”. A week later, I emailed my family about Bruce. I asked them: please remember what joy he brought to their life and to consider writing him. Yes, of course, said my father. I love Bruce, said my mother. He’s a good egg, said my sister. Don’t forget his rollerblading, said my other sister. What’s his email? asked my brother. There is nothing so interconnected and intimate and beautiful as how Aspen grow.